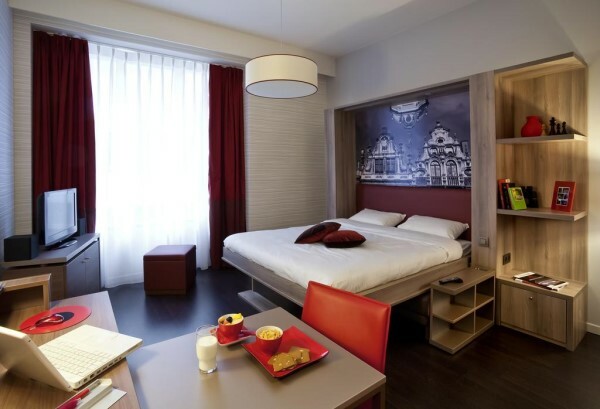 Where to stay in Brussels! 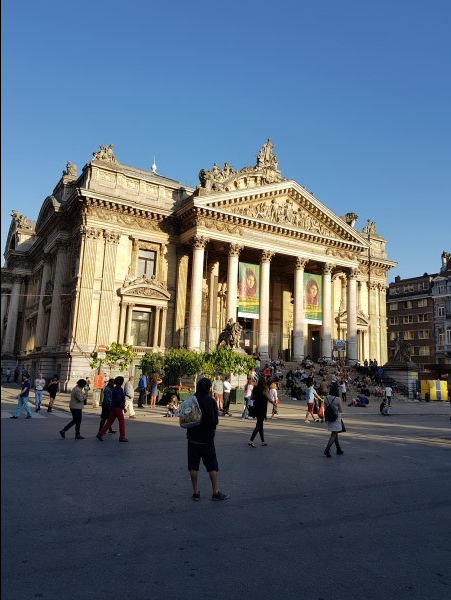 Welcome to the capital of Belgium – Brussels.. You will need at least two days to check out this Victorian beauty. When we talk about Brussels, we are talking about a lot of legends and secrets. In Fact, there is a paid 4 hr walking tour available which reveals all the hidden symbols, legends, and secrets in here. This happens on certain days and needs to be pre-booked. I couldn’t enjoy it during my stay but I did unlock a few secrets :D.
The best thing about Europe is that the days are long and you can see the sunlight till 10 pm. This really adds more energy, at least for me. This is a major attraction, it is actually a big open area surrounded by beautiful buildings. The entire area is full of shops, chocolatiers, secrets, and other amazing stuff. Let me give you a little detour with the help of some pictures, most of the pictures are from my personal collection. The above picture shows the complete square during the 4 days biennial flower carpet show, otherwise, the square remains vacant. Along with beautiful flower decoration, you also enjoy crackers show at night. The event should take place this year during August. This is the Town hall and according to the legend, the architect committed suicide after the completion of the hall because he realized that the tower isn’t in the center, making the hall asymmetrical. This mistake took his life and the name of the architect is still unknown. Seems symmetry meant a lot to the people in those days. This is the Museum which was earlier the King’s house. Rest all the buildings are occupied by guild houses. The square looks beautiful at night with all the lights on. While you walk to this area you will find multiple shops and food outlets in between. You can fetch some good pair of footwear if you find the right shop. Many other attractions are nearby this place, so let’s walk to the next. 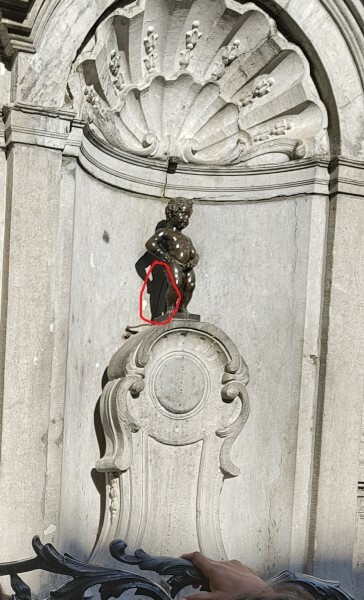 After taking right from the town hall, you will find the corpse of this old man famous for making Brussels free during the war. 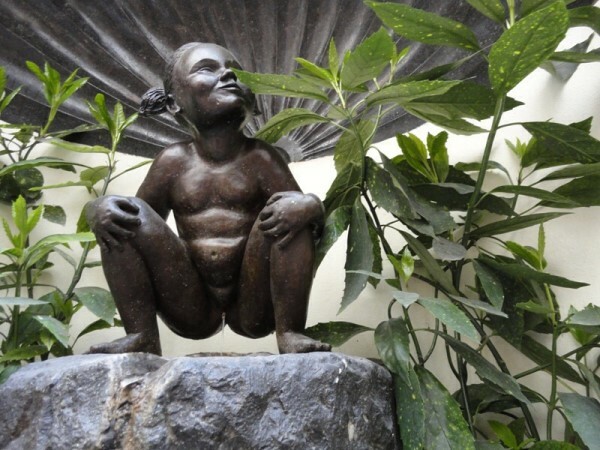 You will see many tourists standing near the statue and touching it or rubbing it. Well to answer that, these actions are believed to bring good luck to the person. If you have a desire then just quickly hold his right hand and wish for it. The right hand is just above his name board, right under the statue. Well, apart from that, you can also rub his forehead and get some luck. You are going to see this a lot, all around, in and out, in many forms like magnets, shop names, menu items and this is funnyyy! After you make a wish, just continue straight on the road and you will find this boy on your left. You must be wondering how true is this story, spoiler alert, check out the below image. You will get chocolates in many shapes here and even in the shape of Manneken. I would not want to eat it though.. This is the molecule shaped observation deck of Brussels. Do you see a flag on the topmost atom, that is the actual deck and you reach there by elevator. 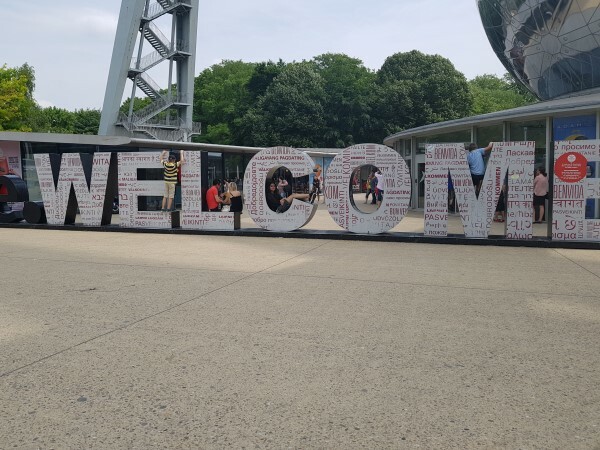 Once reached, you can enjoy the view of Tokyo, Berlin and many other countries. Yes, you read it right but don’t get your hopes too high. Check out the image below. You know that those countries are there but you can’t watch much through naked eyes, maybe something through telescopes but nothing special. Telescopes and information boards are fixed around the deck. You can insert a few euro coins and enjoy the view. I will recommend enjoying views from decks like Eiffel tower, London eye etc.. This is also nice but you have better options to avail than this. Rather than visiting the above attraction, visit this. 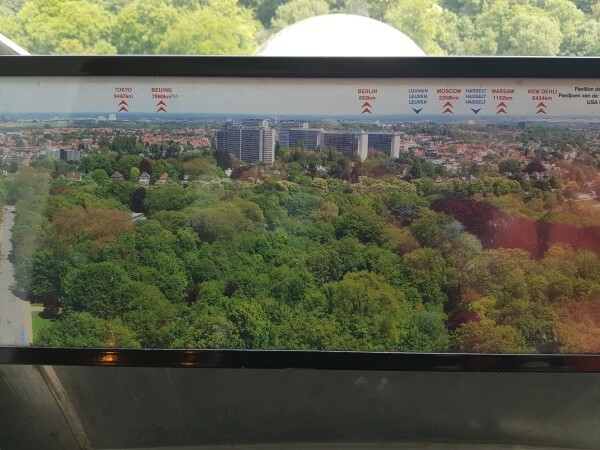 It is within walking distance of Atomium. 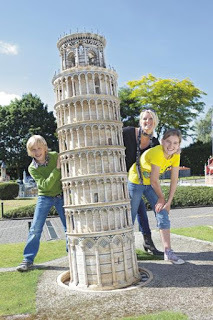 You can see many marvels from all over Europe here in miniature form and that is why I mentioned earlier that you can visit Leaning tower of Pisa in Brussels.. If you love taking photographs then this is the best place to get some fun and innovative pics. This is your only chance to make your own Gulliver’s travel so grab it. For the above 2 attractions, get down at the ‘Heysel’ station if traveling by metro. Above are the few must-visit places when you are here. There are many museums here which can leave you astonished like Musical Instruments Museum, Comic strip center, Autoworld etc. Autoworld is a museum of vintage cars so if you love cars, just buy your tickets. 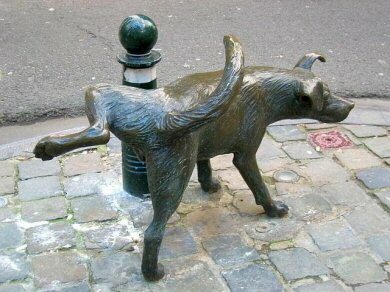 You get it all over Brussels n even in Amsterdam. 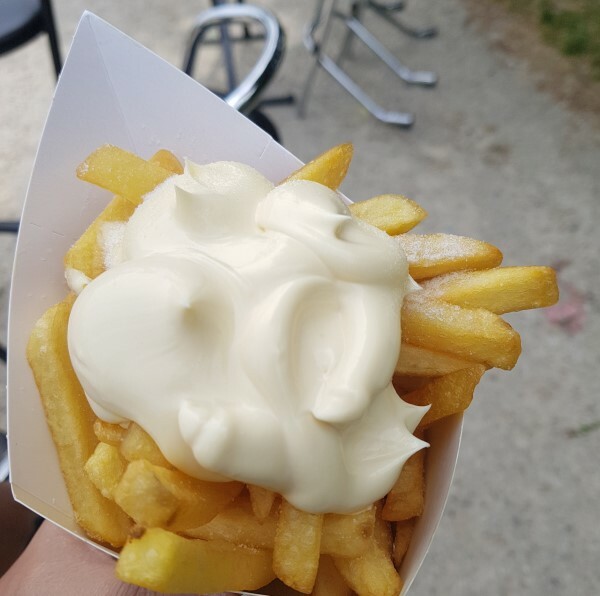 The picture is of the fries from a van nearby Atomium. If you don’t want the mayonnaise on the fries then you can open the folded compartment in these paper cones. Most of it has those. You can’t miss it, simply cannot afford to miss it. 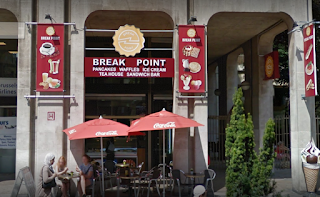 This outlet is called ‘Break point‘ and it serves many yum flavors, check out the images below. 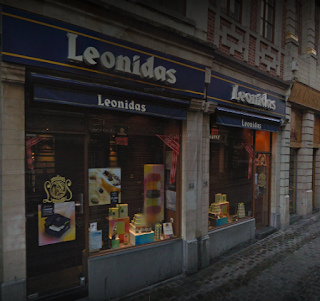 Brussels is famous for chocolates and you will find many many chocolatiers here. 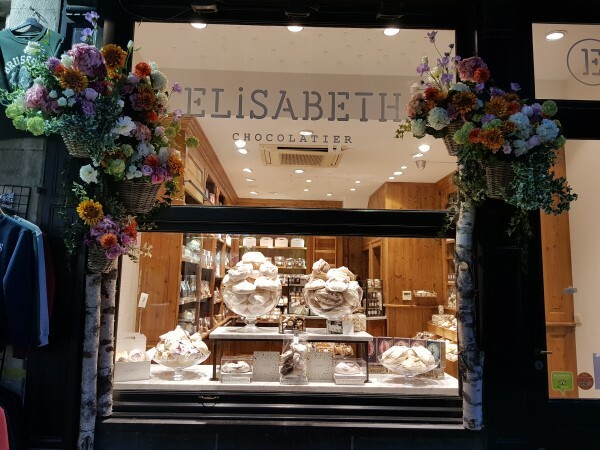 Many blogs say that you can taste as many chocolates as you want from such shops but that isn’t true. You can’t, maybe one or two but not more. 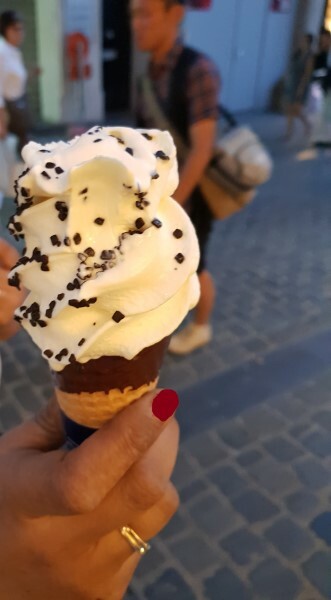 Get this heavenly taste from Leonidas, again near Grand place. In fact, this road leads to the place. I couldn’t wait to click as I was so tempted that’s why the shape is like that..lol. 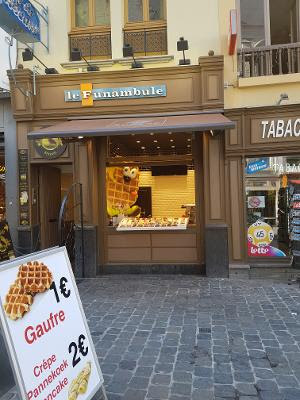 Another famous street food of Brussels, you will get the variety of waffles here. 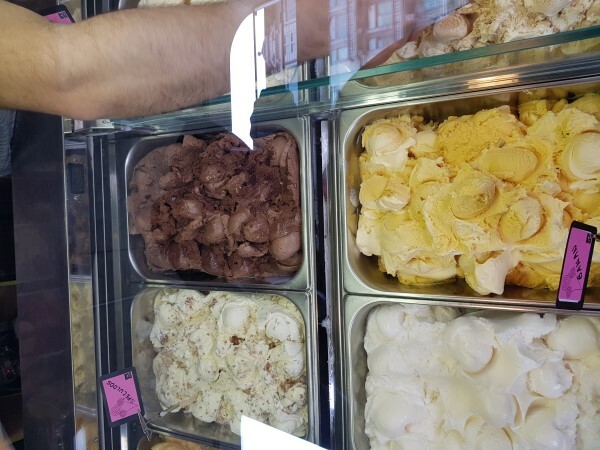 You can have toppings of chocolates, fruits, cream, sugar and much more. 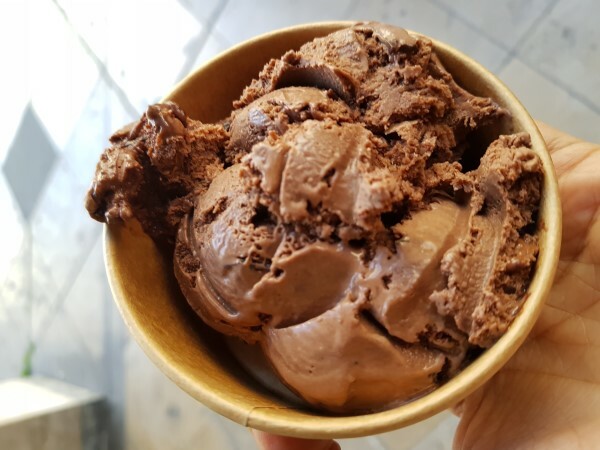 All including no topping waffle are yum and should not be missed. You can find it easily everywhere in the city. 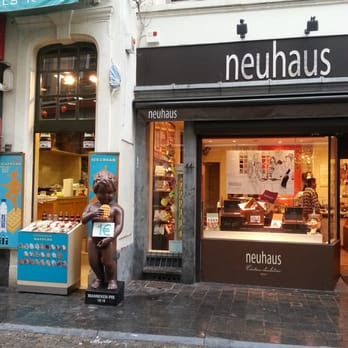 You can find many Neuhaus stores in Brussels, I am sure there are more than 20 in this small city. It is a famous chocolate brand and is obviously cheaper here since it is a Belgium brand. Do try these chocolates, buy a pack with mixed flavors. Liquor flavors are good and are not easily available in Asia. 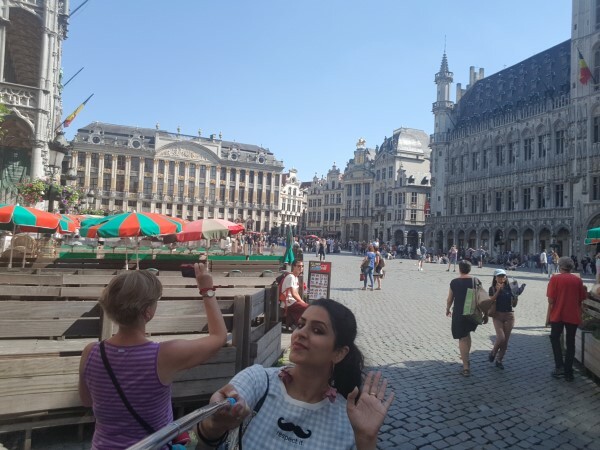 There is much more to offer in here, do let me know about your experience and what else I should try when I revisit Brussels. 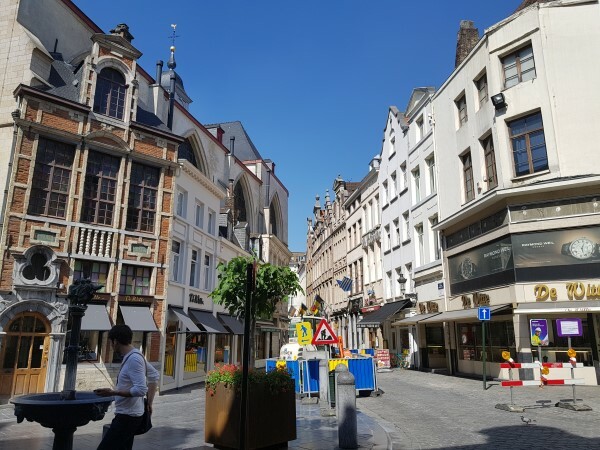 It is in the opposite direction of Grand place and is at a walkable distance from it. You will find many familiar brands here. It is an apparel and accessories brand. You can find good and cheap jewellery here. You can find anything and everything here. It is very cheap and you can grab good stuff in less. It is kind of a departmental store, you will get a plethora of nail paint colors, makeup brushes and other useful stuff here. and many more, I can’t recall more names but the street is huge and offers a lot of stuff. You cannot cover the entire market in one go if you are really shopping. This market is more than sufficient to cover what Brussels offer. If you are really interested in buying from luxury brand then only you should visit this market otherwise the above mentioned will take care of all your needs. There are other markets like Vintage and Flea markets as well here which on certain days of the week. I think this is needless to mention but still stay as close to Grand Place as possible because all your needs will be taken care of here. Everything is nearby from here, metro station, attractions, malls, shopping street, Indian restaurant, departmental store, Chocolatiers, food joints, a Casino and the list goes on. These images give you a glimpse of the vicinity and its beautiful architecture. The stock exchange is now being converted into a beer museum and should open this year for visitors. 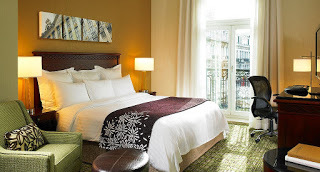 You should stay here if you are looking for good rooms with the kitchen at decent prices. The breakfast is not lavish, it is very simple. Bread, butter, jam, cheese, fruits, tea and a couple of flavors in juices. They have a couple of non-veg options as well. This hotel has good spacious rooms but you have to pay extra to get the room cleaned every day, the complimentary clean up is only once in a week. Usually, people do not stay for many days in Brussels so it is ok to not get the room cleaned for 2 or at max 3 days. Well, it all depends on how you maintain the room. 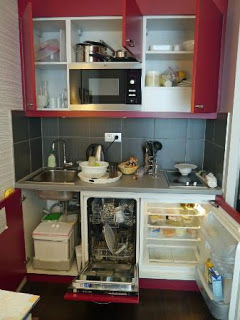 This is the kitchen within in the room. The bathroom is nice and also has a tub. If you are willing to pay more, like just double of what you paid for the 1st option then go for this hotel. This is just 200m approx away from the above-mentioned hotel. The rooms appear to be smaller than the above. I am not sure about the breakfast options. Apart from these two, there are many hotels like Radisson, NH collection etc in the vicinity. Interestingly, almost all the hotels here allow pets to stay with you in your room! I wish I could take mine.. Here is what the metro looks like there.. There are many trains apart from Euro rail that connects Europe. Euro rail offer passes between different places for different duration. It will only be beneficial for some. I would suggest you check routes and prices offered by other high-speed trains like Thalys, TGV etc as well. You will end up saving a lot of money. There are a couple of Indian restaurants in the lane next to the stock exchange. The taste of the food is alright, nothing great. The fun part is that you will have your dinner under sunlight like I did..This image is taken around 9 at night. You will also see people dancing on the streets, around the corner, to fetch some money. And from here I travel to Amsterdam, the city which never sleeps! See you next to next Friday with another fantastic travel experience… You can leave suggestions in the comment box. What place would you like to know more about next? Bangkok? Amsterdam? Hongkong? Go ahead and let me know..
We JUST got back from Paris a week ago, but we were reminded that there were quite a few attractive destinations nearby, like Brussels. Your activities further piqued my interest. 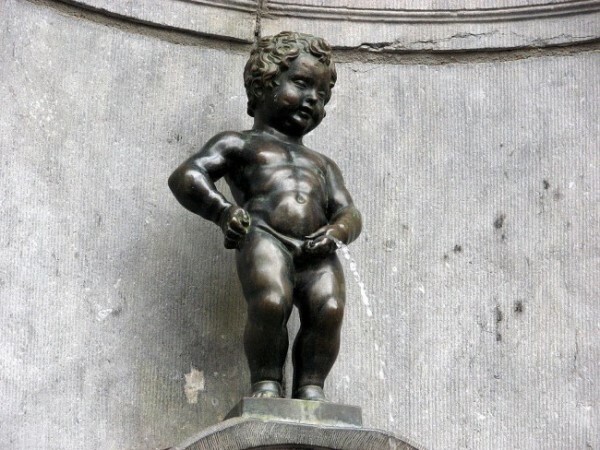 We will have add Brussels to one of our travel lists. Thanks for sharing. Enjoyed your Brussels Visit. By the way i am from Nepal and welcome to Nepal as well. 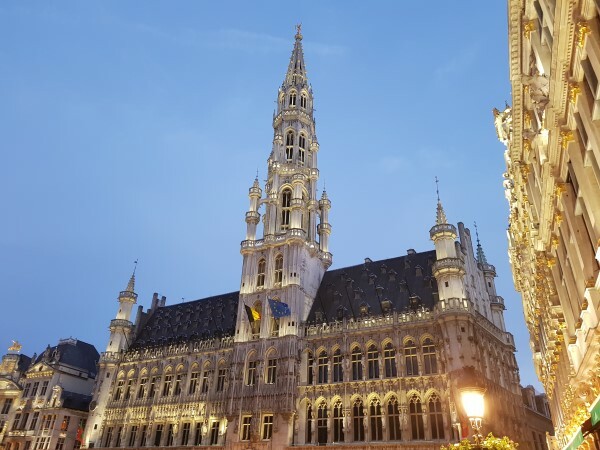 Just reading the post makes me want to plan a trip to Brussels! Thanks for the great tips!